Located southeast of downtown Phoenix, in Maricopa County, Arizona, Sky Harbor International Airport is a civil-military public airport. It is Arizona’s largest and busiest airport, and among the largest commercial airports in the United States. The airport serves as the sixth-largest hub for American Airlines with around 300 daily departures to over 90 destinations in 4 countries. If you’re planning a trip and need a ride to the airport, let Via Trailways help you get there! We want your trip to be as stress-free as possible with your travel needs being the least of your worries. You don’t worry about having to leave your car in a parking lot for an extended period of time. We are a more affordable option, saving you money on gas and regular wear-and-tear on your car. We can transport groups of any size! Choose from our charter buses of four different sizes so that your friends and family can all travel together. Stop and charge your devices or get some work done at one of the airport’s charging stations. Join one of the airport’s clubs or lounges. Exercise between flights at the Sky Harbor Fitness Trail. 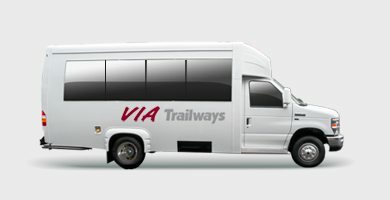 Want to learn more about the benefits of travelling with Via Trailways? Contact us today!